R and R’s relationship is more than just Sun sign compatibility of Libra and Scorpio. No individual is a pure Libra or Scorpio but instead is a unique combination of signs and planets. The following interpretation defines the synastry or interplanetary aspects between the planets in R’s birth chart and the planets in R’s birth chart. There is no evil planet in the combinations. No single combination can make or break the relationship. The list goes from the most harmonious (positive) to the most discordant (negative). R’s Uranus Sextiles R’s Neptune (+5.92 harmony) – R’s respect for expression of individuality combines pleasantly with R’s mystical, spiritual inclinations. Both help each other to bring their individual ideas to life. The relationship encourages each other to think outside the box. R and R have a strong intuitive connection. R’s Venus Conjuncts R’s Venus (+3.98 harmony) – The individual sense of sexuality, attraction, or intimacy combines with ease within the couple. There is harmony in the way each other expresses affection. Social, cultural, and financial values are the same. Both enjoy the same pleasures in life. R and R have the desire to help and encourage each other. The relationship can lead to a long-term partnership. R’s Venus Opposes R’s Jupiter (+3.92 harmony) – R’s sense of sexuality, attraction, or intimacy confronts and challenges R’s spirit of growth, expansion, or generosity. There is tension on how each other will handle finances. R may occasionally accuse R of not being entirely open and honest. R may accuse R of being too open and honest. From time to time this aspect can bestow good luck. R’s Mars Sextiles R’s Neptune (+3.61 harmony) – R’s sexual drive, temper, and powers of self-assertion combine pleasantly with R’s sense of spirituality, imagination, or mystical inclination. The initiative of R stimulates the sacrificial tendency in R. R and R will support each other to a significant degree, both emotionally and creatively. R’s Sun Sextiles R’s Uranus (+2.96 harmony) – R’s sense of identity, ego, will, and character combine pleasantly with R’s sense of independence, freedom, and originality. There is a sense of mutual liberty that stimulates the relationship. Both R and R have the willingness to try out new ideas. Both are highly creative together and are open to an intelligent conversation. Sharing idiosyncrasies together is a fun experience for R and R.
R’s Mars Sextiles R’s Neptune (+1.84 harmony) – R’s sexual drive, temper, and powers of self-assertion combine pleasantly with R’s sense of spirituality, imagination, or mystical inclination. The initiative of R stimulates the sacrificial tendency in R. R and R will support each other to a significant degree, both emotionally and creatively. R’s Mercury Sextiles R’s Saturn (+1.41 harmony) – R’s mentality and powers of perception combine pleasantly with R’s sense of commitment, necessity, or duty. R helps give form to R’s ideas. R learns a lot from R’s knowledge and wisdom. There is natural stimulation when R offers practical guidance that improves R’s life. Both tend to solve relationship problems through careful and logical communication. This is a favorable aspect for long-term relationship including business partnership. R’s Mars Sextiles R’s Saturn (+1.27 harmony) – R’s sexual drive, temper, and powers of self-assertion combine pleasantly with R’s sense of commitment, necessity, or duty. This aspect is suitable for any kind of partnership including business, family, or marriage. R stimulates R’s ambition and self-confidence. R restrains R’s tendency to act impulsively. R’s Moon Sextiles R’s Venus (+0.81 harmony) – R’s emotional needs combine pleasantly with R’s sense of sexuality, attraction, or intimacy. The relationship stimulates deep mutual devotion and affection in each other. Both tend to be liberal on financial matters. R and R have common interests in many things including social activities. There is a strong attraction for love and marriage between R and R.
R’s Jupiter Trines R’s Saturn (+0.58 harmony) – R’s sense of growth, expansion, or generosity combines very effortlessly with R’s sense of commitment, necessity, or duty. R’s practicality is in harmony with R’s expansive ideas. R provides vision while R creates structure. Both work better as a team to achieve significant goals. This aspect is also favorable in a business partnership. R’s Sun Conjuncts R’s Mercury (neutral) – R’s sense of identity, ego, will, and character combine with R’s mentality and powers of perception. There is effective communication and fewer misunderstanding between R and R. Both can work together in their similar ideas and points of view. R supports the progressive ideas of R. R understands the unique individuality of R.
R’s Sun Conjuncts R’s Sun (neutral) – The couple’s sense of identity, ego, and character can combine with ease or difficulty. R and R have many positive and negative traits in common. The similar qualities can combine to aid understanding of one another. It may also cause rivalry with each other. R’s Saturn Trines R’s Saturn (neutral) – The individual sense of commitment, necessity, or duty combines very comfortably with the couple. Both R and R can work as a team on a common goal and can accomplish whatever they set their minds to. This is a good aspect for a long-term relationship. R and R’s attitude toward responsibility and security are in harmony. R’s Mercury Conjuncts R’s Uranus (neutral) – R’s mentality and powers of perception combine with R’s sense of independence, freedom, and originality. There is a fusion of intellectual and mental awakening in R and R. Both bring out each other’s innate genius and encourage its development. The relationship generates tremendous creativity in each other. Communication flows smoothly. Both enjoy the frequent exchange of challenging ideas. R’s Sun Conjuncts R’s Uranus (neutral) – R’s sense of identity, ego, will, and character combine with R’s sense of independence, freedom, and originality. The creative talents of R combine with the individualism of R. There is always something extraordinary or unconventional in the relationship. R is uncertain of how R will react in a given situation. The erratic tendency of R has a disorganizing effect on R.
R’s Uranus Conjuncts R’s Pluto (neutral) – R’s sense of independence, freedom, and originality may combine or resist with R’s sense of transformation, change, or power and destiny. The intensity will depend on other factors of the relationship. This is favorable if R and R have more aspects in harmony than in discord. R’s Mercury Conjuncts R’s Mars (-1.16 discord) – R’s mentality and powers of perception combine with R’s sexual drive, temper, and powers of self-assertion. Both stimulate the exchange of ideas and self-expression in each other. The relationship inspires a lively and productive conversation. Friendly debates can sometimes lead to irritation if R is headstrong or argumentative. R can be impatient and wants immediate action while R intends to plan before taking any action. R’s Mars Conjuncts R’s Pluto (-1.39 discord) – A delicate combination of R’s sexual drive, temper, and powers of self-assertion with R’s sense of transformation, change, or power and destiny. There is resistance to the display of authority by the other. Both can be vindictive toward each other. The relationship is extremely competitive for R and R.
R’s Mercury Opposes R’s Jupiter (-1.67 discord) – R’s mentality and powers of perception confront and challenge R’s sense of growth, expansion, or generosity. There is tension in the exchange of ideas in the relationship. R will seem petty to R. R might promise more than can be delivered. This is not a serious conflict if there are many harmonious aspects to the relationship. R’s Saturn Conjuncts R’s Neptune (-1.98 discord) – R’s sense of commitment, necessity, or duty may combine with R’s sense of spirituality, imagination, or mystical inclination. This aspect is neither beneficial nor harmful to the relationship. R can add a degree of holiness to R’s practical goals in life. In some cases, there will be doubts, deceptions, and misunderstanding in the relationship. R’s Mars Conjuncts R’s Pluto (-2.53 discord) – A delicate combination of R’s sexual drive, temper, and powers of self-assertion with R’s sense of transformation, change, or power and destiny. There is resistance to the display of authority by the other. Both can be vindictive toward each other. The relationship is extremely competitive for R and R.
R’s Sun Opposes R’s Jupiter (-3.37 discord) – R’s sense of identity, ego, will, and character confront and challenge R’s spirit of growth, expansion, or generosity. There is tension between R and R’s philosophy of life. R and R are having difficulty recognizing their differences. They expect too much from each other. Both have the tendency to encourage over-indulgence in some form or another. There is less give-and-take in the relationship. R’s Mercury Conjuncts R’s Mars (-3.68 discord) – R’s mentality and powers of perception combine with R’s sexual drive, temper, and powers of self-assertion. Both stimulate the exchange of ideas and self-expression in each other. The relationship inspires a lively and productive conversation. Friendly debates can sometimes lead to irritation if R is headstrong or argumentative. R can be impatient and wants immediate action while R intends to plan before taking any action. R’s Moon Squares R’s Uranus (-5.16 discord) – R’s emotional needs interact stressfully with R’s sense of independence, freedom, and originality. The friction can arouse irritations between R and R. R is eccentric, inconsiderate, and unpredictable. R is hypersensitive and moody. Any romantic attraction can lead to an unusual relationship that may not last long unless other aspects stabilize the connection. R’s Sun Conjuncts R’s Mars (-5.76 discord) – R’s sense of identity, ego, will, and character combine with R’s sexual drive, temper, and powers of self-assertion. The creativeness of R combines with the aggressiveness of R. Friendly competition is typical in the relationship. There is a physical attraction between R and R.
R’s Saturn Squares R’s Pluto (-6.39 discord) – R’s sense of commitment, necessity, or duty interacts stressfully with R’s sense of transformation, change, or power and destiny. There is friction in the struggle for power and authority in the relationship. R being a reformer might challenge R’s attitude towards responsibilities of life. R’s Moon Squares R’s Saturn (-13.74 discord) – R’s emotional needs interact stressfully with R’s sense of commitment, necessity, or duty. The friction can easily create misunderstanding between R’s practicality and R’s emotions. Both have opposite ways of handling everything from finance, lifestyle, and stress. R can be restrictive, disciplinary, judgmental, inconsiderate, and selfish toward R. R can be moody, impractical, fretful, and oversensitive toward R.
There are 3 mutual receptions in R and R’s planet combinations. Planets in mutual reception enhance each other. This will add +30 harmony to the total score. The remaining -19.47 discord is due to some minor aspects or planets in parallel. 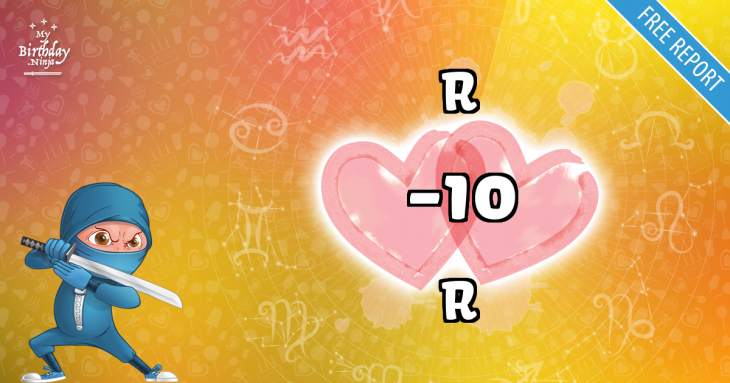 This is only a quick assessment of the relationship compatibility between R and R. If both place and time of births are known, an in-depth interpretation is available in the Star Lovers Report. Try a free sample with no obligation to buy. Ssshhh! R, don’t let R know. You are most compatible with a person born on February 27, 1964. You have a whooping birthday love match score of +168 with that person. Check it out and imagine what it feels like to be with your soul mate.